Obituary – Eby, Don Carol « Perry High School Alumni Association, Inc.
– 20 years old, is the son of Mrs. Marie Alton. He was born March 31, 1920 in Tulsa. Before coming to Perry he attended the Washington Grade school in Tulsa. He was a member of the cast of the senior play this year, was vice president of his junior and sophomore classes; president of his home room during his sophomore year; president of his home room class during his junior year and secretary and treasurer during his senior year. He lettered three years in both football and basketball. He played center on the high school football team for four years and center and guard on the basketball team for four years. This past year he has served as captain of the basketball team. He also wrestled during his sophomore year. He was active in scout work, having been a First Class Scout. His hobbies include swimming and hunting. Next year he plans to attend Central State College in Edmond, studying commerce course in the school of business administration. Don C. Eby, 45; former resident of Perry died at 11 p.m. Tuesday in Veterans hospital, Oklahoma City, where he had been a patient two years. 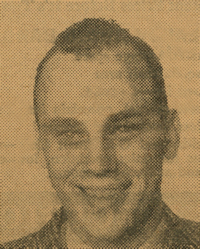 Eby, a 1940 graduate of Perry high school, was the son of Mrs. Marie Wetzel of Perry. He was born March 31, 1919, in Tulsa, and attended Washington grade school there before coming to Perry. While at PHS he lettered three years in both basketball and football, and was captain of the high school has basketball team. He was vice president of his junior and sophomore classes. Eby served with the Air Force in the South Pacific during World war II as a bomber pilot, achieving the rank of captain. He was a member of St. Rose of Lima Catholic church. Rosary will be at 7:30 p.m. Friday at the Parker Funeral home. Funeral mass will be at 10 am. Saturday in St. Rose of Lima Catholic church with burial in the Catholic cemetery. Services, will be in charge of Rev. John G. O’Brien, pastor of the Catholic church.